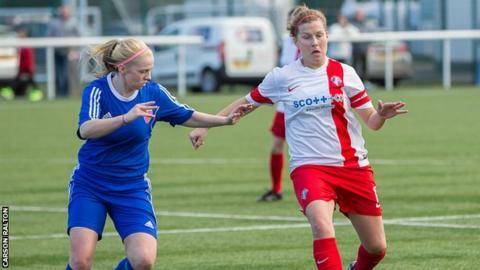 Spartans Women went top of the Scottish Women's Premier League with a 3-1 victory against Forfar Farmington, who had Robyn Smith sent off. Alana Marshall scored from the penalty spot before Mariel Kaney and Katie Reilly added further goals. Glasgow City edged out Celtic 1-0 with Clare Shine on target. Hibernian Ladies were held 0-0 away to Aberdeen, while Rangers got off the mark for the season with a 4-1 win over Stirling University. At Ainslie Park, the hosts were given the chance to go in front when Marshall was upended on the edge of the box. After the Spartans playmaker dispatched the penalty herself, Amy Gallacher responded immediately for the visitors with a fine solo effort - running from the halfway line before finishing. Forfar's celebrations were short-lived, however, as Smith was shown a red card for an off-the-ball incident. Spartans regained the lead on the hour mark when Marshall's corner forced a goal-line scramble and Kaney eventually nodded in. Kaney then fed Reilly, who wrapped up the win with a first-time strike. Manager Suzy Shepherd was delighted to make it two wins from two, following up their opening day win over Aberdeen. "There's not going to be any easy games this season in the new eight-team format and we are just taking them one at a time," said Shepherd. "Credit to the players for the hard work they are putting in on the training ground and then taking it into games." City played their first game since losing Denise O'Sullivan to Houston Dash, but it was her Republic of Ireland team-mate Shine who netted the all-important goal to maintain City's perfect start to the campaign. "Today we needed to dig in for the result and when that happens the fluid football we want to play can at times be affected," said City head coach Scott Booth. "The girls worked really hard to ensure the victory. We know we can be better, but it's three points and another clean sheet. We are happy with the momentum we are building." Read more on How did Hibs striker Cummings miss this?